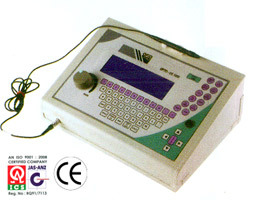 A – Scan Machine – Optofine Instruments Pvt. Ltd.
We are Manufacturer, Supplier, Exporter of A – Scan Machines and our setup is situated in Sangli, Maharashtra, India. A compact and light weight US 100 'A' Scan Biometer measures highly accurate axial length with anterior chamber depth, lens thickness and vitreous length of eye. Specially designed software eliminates corneal compression readings. Facility to enter personal contrast and new velocities for new IOL material or silicon filled eyes. Automatic measurement mode eliminates reqquirments of foot switch for easy operation. Can be upgrades to add Pachymetry. Upgrade of water immersion technique option is available. SRK, SRK II, SRK-T, Blinkhost, Halladay.